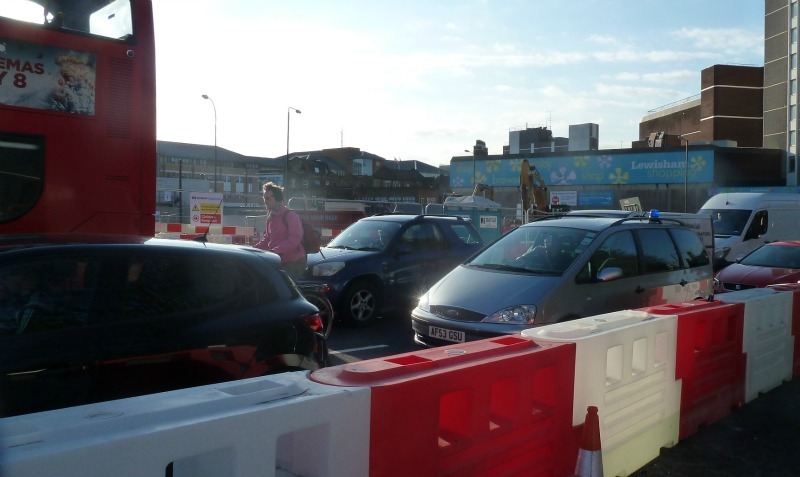 Lewisham Gateway: A New Junction Fit For the 21st Century? This is what Darren Johnson, Elected member of the GLA and chair of the GLA Environment Committee told us. He’s absolutely right and you only have to take a ride or walk down to the junction to see why. At the moment it’s a confusing layout, a jumble of roads amidst a mess of construction with traffic herded between large, garish red and white blocks, giving it the appearance of a go kart racing track, with both drivers and cyclists often confused about where they are meant to go. So, will it all be sorted and safe for cycling once it’s done? Well, we don’t believe so. So why on earth not? Two years ago, representatives of Lewisham Cyclists attended a meeting where we were shown the attempts made by TfL to incorporate some cycling provision in the so called Low H road design that would encircle the new Confluence Place developement. At the meeting, were representatives from TfL, the developer, Muse and the council. It might have been more efficient had they asked our advice before setting out what they thought would be workeable solutions for moving cyclists through here. But we won’t go into that problem here. We reported back on that meeting back then, so I won’t go over the details of our disappointment and disbelief that a modern junction, starting from scratch, could be built in the twenty first century with such scant provision for a group of its most vulnerable road users. If you wish to remind yourself, the details are here. This spring, the roadworks were well underway and large numbers of cyclists began consulting us about how unsafe they felt, how dangerous it was, negotiating the half finished system. We contacted TfL straightaway, back in May. You can read our letter here. It took us several weeks to get a response from the TfL officer responsible for overseeing the development. His reply is here. We were not happy with this response, partly because it ignored completely our request to meet and discuss the issue, to come down and ride the junction with us and also because it didn’t address our concerns and those of the people riding this junction every day at all. The first paragraph seemed to imply that the reason they weren’t including safe space for cycling was that there wasn’t any safe space for cycling. I had to read it several times to check, but really that’s in essence what it says. Catch 22 indeed. We felt that the very least that TfL should do, at this point, was to join in us in a site visit and ride while the development was underway. No such visit happened, despite our offer. Since TfL seemed to be ignoring our request for a meeting, we contacted individuals whom we thought they might not be so quick to ignore. We emailed councillors, Darren Johnson, Andrew Gilligan, Len Duvall, the GLA member for Greenwich and Lewisham. Soon after this we did indeed receive a response from TfL, acknowledging our request for a meeting and offering to set one up. So, finally, after a lot of work from us and input from others with more political influence, we finally set a date. And met with TfL at Palestra last Tuesday 29th August. They began by going over what we knew already i.e this is a developer led initiative, a regeneration project first and foremost, and the road system is being designed within the constraints placed upon it by that development. We understand this (even though we, along with many others, including TfL, are not that happy with it). However, our contention was that even within this, there was still ample room to provide safe and protected space for cycling. We presented designs for road junctions which TfL have adopted elsewhere which are vastly superior to the proposals for Lewisham Gateway, in terms of providing safe space for cycling, and which we believe do not affect the capacity of the junction to deal with other modes of transport. TfL was concerned that the impact on traffic flows would cause excessive delays to other transport modes, especially buses. As far as they are concerned, all their modelling shows this to be the case. I should point out that there are serious concerns about their traffic modelling and its efficiency and efficacy being taken up by other pressure groups elsewhere. But it’s hard to get Tfl to look beyond it, despite this. So, we had met an impasse. TfL believe they have made all the concessions they can at this junction, allowing as we asked 2 years ago, that cycle traffic be allowed to pass through Confluence Place at the heart of the development. That was allowed, despite opposition from the developer. We asked two years ago for dropped kerbs and cycle links to other routes into and out of Lewisham centre. Some of these links have been included. But, the junction itself, a major link for anyone travelling from a huge section of the borough of Lewisham and beyond, will remain a multi lane nightmare. Tfl themselves admit they would only expect skilled and experienced cyclists to attempt to use it. We would argue it won’t even be safe enough for them. And where does this leave Lewisham Council’s own promise set out quite clearly in the Lewisham Town Centre Local Plan under Objective 6:”Transport: To encourage patterns of development which support walking, cycling and the use of public transport.” Well, we see no evidence of these patterns of development at all, especially in relation to cycling. In fact we would argue, a dangerous multi lane junction at the heart of a London borough discourages and dissuades people from even thinking about riding a bike instead of taking their car or squeezing onto our already overloaded buses and trains. That’s a real shame. Especially given the council has been running an extremely successful bike loan scheme and training programme for some time now. Great ideas, very popular with Lewisham residents, but without the commitment to safe space at this key point in the borough, where are many of these people supposed to ride. Apart from the Waterlink Way, not very far. We believe it’s still not too late for TfL to adapt the design to which they are working. We have shown them alternatives which could be overlaid on what is being built at the moment. They themselves have seen similar schemes in other parts of London, beginning to appear, such as the one at the Oval. 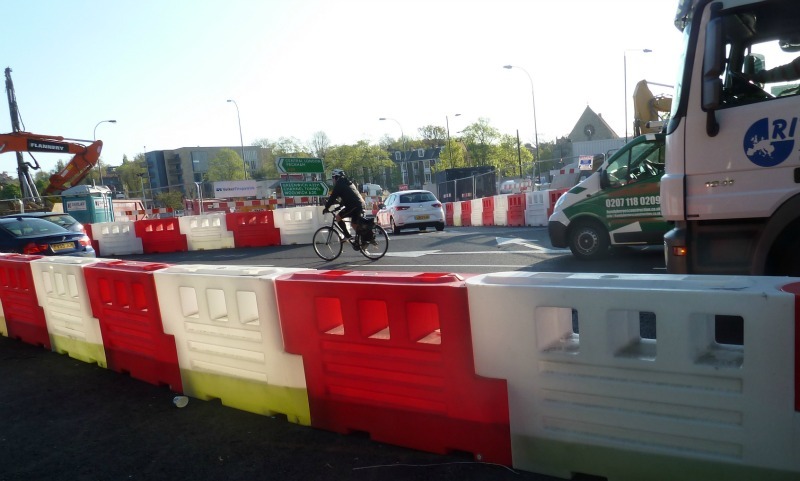 Here, provision is being made for cyclists to pass through this equally busy and imporatnt junction, without fear of being left hooked or hit by motor traffic, safe provision that does not impact significantly on the journey times of other road users. 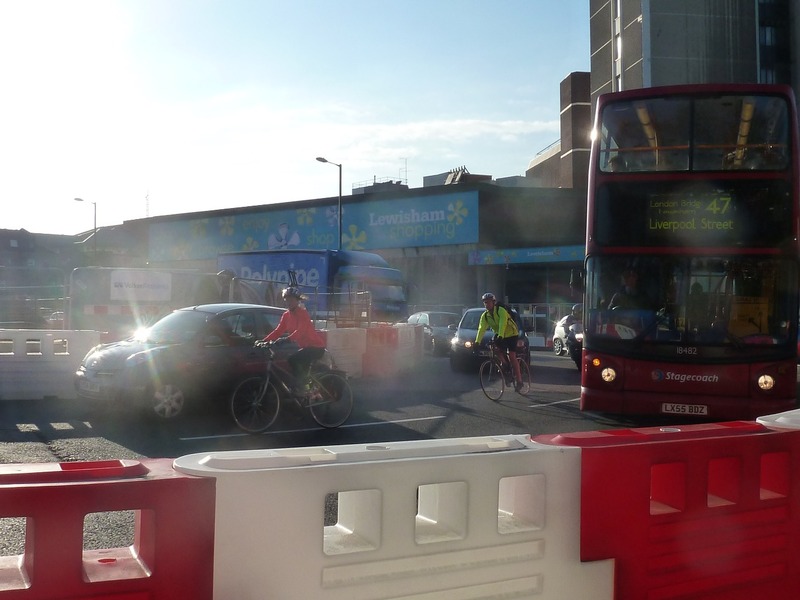 It is possible to build a junction fit for the 21st century at Lewisham Gateway and to fulfill the council’s commitment to encourage cycling and walking. But the junction being built at the centre of our borough at the moment is not that junction.